Redunkulous. 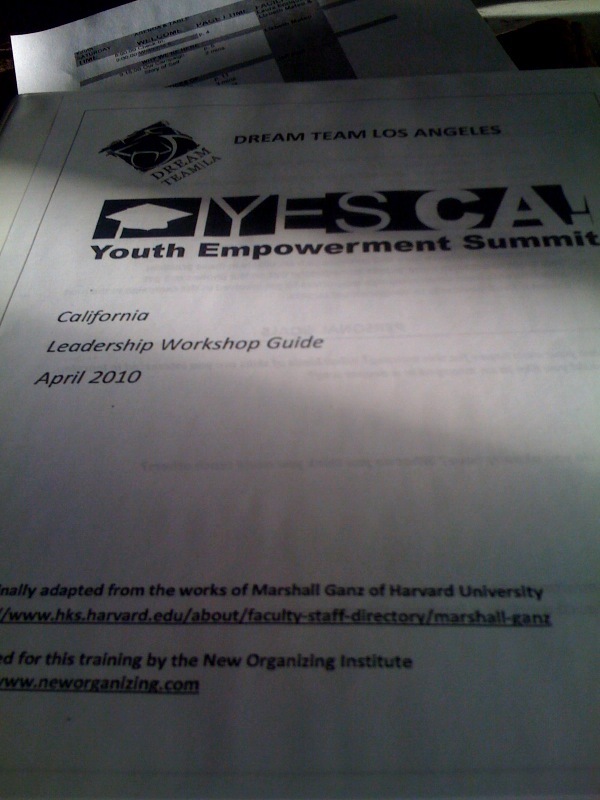 I have to make up words to describe the training Dream Team Los Angeles just put together. It was off the hook I tell ya what. All the hard work and planning paid off and the youth that attended our training rocked it. I'm serious. They showed the kind of potential that makes you wonder what they will do later on in their lives once they finish school and make their way into the world. Truely, it's bitter sweet that there is another generation of youth taking up the cause of fighting for undocumented students, parents and immigrants. You think this would have been a problem that would have been addressed long ago, but even when the DREAM Act passes, work will still need to be done in different forms and the need to help youth come into their own, learn to organize and create change in their communities. I had the opportunity today to help 8 individuals learn to foster and harness their latent potential by showing them techniques on how to organize, just as my fellow Dream Team L.A. colleagues did with their kids. We helped them find common ground with complete strangers, how to work as a team and how to come together to make things happen for the better, using their own personal talents and drive to make it all happen. Never in my life have I had the honor pass on knowledge and strength to others in all my life. The best part of it all was that I did it all by being me. I took the instructions, made them my own, cracked jokes, gave examples and helped them put all the pieces of the puzzle together. It's like some warm fuzzy feeling inside my tummy, that or I'm just hungry again. There's no doubt that even though I wish I was somewhere else in my life, this is where I need to be. I work with some of the most amazing individuals who give of themselves to make this happen. They balance their lives and add organizing for undoc youth to their scales. We all have our reasons, but like the training we taught today, we all have a common goal, a shared story and a driving passion that can never be snuffed. Just like the superheroes I love to read about, I'm surrounded and work with people that put them to shame. People that will be influential in the near future, sharing with another generation of kids their experiences, tribulations and the work they do. Life goes around in circles like that.